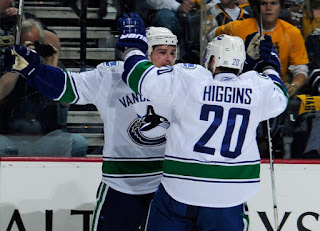 Chris Higgins and Sami Salo will be back in the fold for another season. Higgins signed a 2 yr deal at $1.9 million per year, while Sami Salo signed a $2.5 million deal for one season. The Canucks also went out and signed one new player, Mark Mancari from the Buffalo Sabres. Mancari is 6'4" 225 and scored 8 points in 20 games with the Sabres last season. Mancari is a 7th round draft choice and is 25 years old, but did display some touch around the net in the AHL, recording some very strong point-per-game seasons there. Look for Mancari to line up on the Canucks fourth line with Max Lapierre and perhaps Victor Oreskovich next season. Hansen and Oreskovich still must be signed up front, but that leaves Cody Hodgson back in the AHL. There is also the question of the injured Mason Raymond. The Canucks could nab a talented winger to play with Kesler, or they could simply move Higgins up until Raymond returns. The defence appears set as well, with Chris Tanev and Andrew Alberts waiting in the wings. As it stands, the Canucks have $57,000,000 spread across 10 forwards, 7 defence, and 2 goalies. Assuming Hansen and Oreskovich take $2.5 million, the Canucks may have as much as $4-5 million in cap space to make a trade or sign a remaining UFA. Marco Sturm would be a good fit, and Anthony Stewart also may be cheap. He is big and could be just what the Canucks need.